In this new series of paintings, Bradley Stevens honors the artists who have influenced him and the museum-goers,in this case, all women––whom he sees as the vanguard of art, culture, and progress in these times. 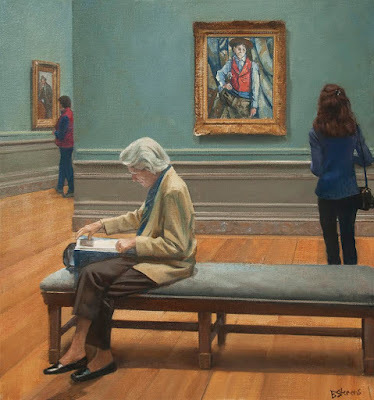 By returning to his theme of museum interiors, Stevens relives his student years copying Master paintings at the National Gallery of Art and implements the lessons these artists have taught him. With his mastery of color, composition, and gesture, he lures us into the gallery and creates the intimacy of experiencing art. Inspired by the resurgence of the women’s movement, he has chosen to feature women as advocates of these hallowed museum spaces. Their poses and expressions reveal complete captivation with and immersion in the art, such that the physical and psychological act of “looking” is the subject. Stevens’ introspective museum studies are a meditation on the enduring power of art to educate, inspire, and transcend, and on women’s leadership to protect its place in our society.